Our brain tumour research team; led by Professor Oliver Hanemann, produce 'world-leading' research according to the Research Excellence Framework, 2014. This accolade attracts some of the brightest minds to our Brain Tumour Research Centre of Excellence to conduct their PhD research in our labs. 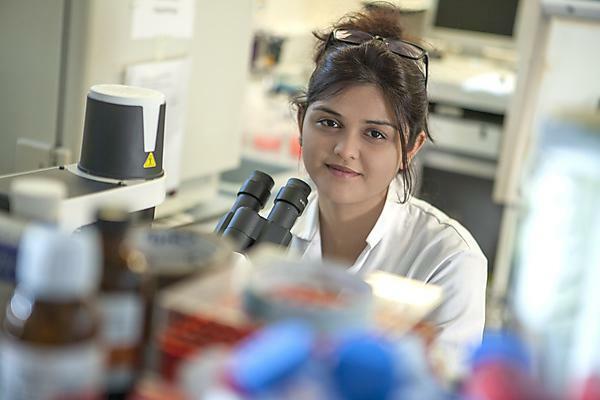 In our commitment to producing 'world-leading' research, we fundraise to support the cost of these PhD studentships which can reach up to £98,000. Foram Dave has a masters degree in biotechnology from VNSGU in India and a masters degree in molecular medicine from Brunel University, London. She has come to Plymouth University Peninsula Schools of Medicine and Dentistry with a wealth of research experience gained in India and in the UK. Her research project focuses on the NF2-related, nervous system tumours such as schwannomas, meningiomas and ependymomas, characterized by the deficiency of tumour suppressor merlin. Email campaign@plymouth.ac.uk to register your interest and we’ll provide you with details about opportunities to make a difference. You can also contact us on +44 1752 588045.